Virtually 99 percent of the time, according to executives for retail pharmacy chains, a pharmacist counseling value-conscious patients will bend across the counter and start talking to them about generics, that classification of efficacious drugs that are available, often at very significant savings, as a solid alternative to off-patent brand name drugs. Especially in today's depressed economy, retail chains, striving to help keep health care costs reasonable and to meet the needs of financially strapped patients, are promoting generics more than ever, using pharmacist-to-patient consultations as their primary communications vehicle, but also promoting the value and benefits of generics in their Web sites, circulars, radio commercials and prominently placed in-store point-of-sale materials. "The single biggest value of generics," said Walgreens spokesman Michael Polzin, "is that they lower the cost of health care while getting the same results as a branded drug. "Generics also helr with the issue of compliance because their lower cost makes it easier for people on a tight budget to be compliant." Retailers across the board agree that cost savings is among the biggest assets in generics' favor. "The biggest headline today in health care is costs," said Gerry Bay, vice president of pharmacy operations East for Albertson's. "Prescription drugs represent between 7 percent to 10 percent of national health care costs, and the costs of increases for prescription drugs are one of the highest in the health care category. So it's a major concern for those of us in health care--particularly when it comes to the elderly living on a limited budget. "We promote generics as a low-cost prescription alternative with the same therapeutic effects as branded drugs whenever possible. These are affordable and effective drugs that can help the elderly and the total population live healthier lives," Bay added. Both Walgreens and Albertson's promote their generic drug programs in a variety of ways, including having ongoing pharmacist education programs in place that keep their pharmacists informed about new generics as they come into the marketplace. Walgreens, which also promotes generic drugs on its Web site, does not release any financial data about the sales growth of generic drugs in their pharmacies, but Polzin noted that sales of generic drugs have been growing steadily each year. "Generics are important to us because they offer a big benefit to our patients, and we've always tried to put the interests of our patients first," he explained. Bay indicated that at Albertson's, sales of generic prescriptions have risen about 5 percentage points over the past 18 months and now account for about 47 percent of all prescriptions filled at the retailer. "We have to offer alternatives to our customers as part of what we do to distinguish ourselves from our competition," Bay asserted. "By giving our patients as much information as we can about generics, we are providing value in the form of information sharing, and even if a generic does not save a customer money in terms of their co-pay or the cost of their drug, we provide information to help them understand that buying a generic helps to lower health care costs." However, the cost factor can be significant, chains agree. "Even if a brand drug is listed as a preferred drug on a patient s insurance plan, there can be significant savings between that drug and the generic," said Happy Harry's vice president of professional services Jack Murphy. "But when a branded drug is not listed as a preferred drug, the savings can be tremendous. You could be talking a $7 or $7.50 co-pay for a generic versus $20 for a brand drug that is part of a preferred listing or $40 for a drug that is not listed as a preferred drug." Murphy said the best medium for promoting generics is "a pharmacist talking one-on-one to a customer, explaining the benefits of the generic equivalent of a brand drug and outlining the value that generics offer." A substantial part of that conversation is about assuring patients about generics' reliability. 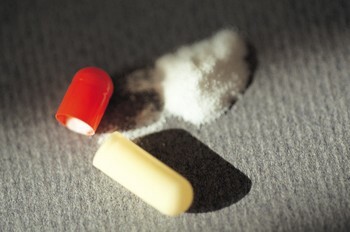 "By the time a generic comes along, the efficacy of the drug has been established," Murphy said. "You know it's useful, and you know you can offer it to your customers at the best possible price." Murphy also credits Delaware's Medicaid program for its efforts in raising consumer awareness by promoting the benefits of generics. "Medicaid in Delaware requires the doctor to verify or justify the dispensing of a brand-name drug," said Murphy, "and that's really helped drive sales of generics." New legislation passed Jan. 3 could have a positive impact on generic substitution, based on changes to physicians' prescription pads. The new law does away wit the two "dispense as written" and "substitution permitted" lines. "The old format caused many physicians to sign on the 'dispense as written' line, thereby ruling out the possibility of choosing a generic," Murphy observed. "The new system has the doctor signing on one line only, and this line reads 'substitution permitted.' A further directive underneath states that in order for a name brand to be dispensed, a note indicating that a brand name drug is medically necessary must be hand written by the physician, so the new law gives more choice to the patient and pharmacist to choose a generic." Currently, about 38 percent of Happy Harry's prescription business in Delaware is for generics, but in states like Maryland and Pennsylvania, where Happy Harry's also operates stores and where a one-line signature prescription pad is standard, the generic portion of their prescription business is in the mid-40s. "That's what we're shooting for," said Murphy, "and now that we have this new law, we should be able to get there in Delaware, as well." In Florida, Dan Miller, vice president of pharmacy operations for Eckerd, said generic prescriptions provide value to consumers by "treating their health conditions at an optimal level at a reduced cost to them or to their insurance carrier." And that, Miller points out "can transmit into reduced or contained prescription coverage costs in the future." Eckerd promotes generics by providing its customers with information about generics through brochures in its stores and by having pharmacists explain "the therapeutic equivalency and the benefits of generics in terms of savings." Customers, said Miller, can also learn about generic prescriptions through the in-store signage, which he said Eckerd puts in place "based upon the state guidelines explaining that a generic alternative can be provided." In New York, Duane Reade relies not only on ads in circulars and on the radio to help consumers develop an appreciation for the value of generics, but on pharmacists' own integrity. "Bringing awareness to the consumers, that's how you get the message out," said Chris Lane, Duane Reade's vice president of pharmacy operations. "I'm a pharmacist, and I've been taking generics for a long time." Last spring, Duane Reade introduced a sticker-on-package program that promotes generics. "Sometimes when a pharmacy is really busy, it's difficult to get the pharmacist to step away and talk to every customer about generics," Lane said. "So each time a branded drug is dispensed when there is a generic equivalent available, we put a sticker on the package ... to remind the patient to ask their pharmacists about the generic equivalent. "It's helped with our customers because they're not being asked to spend time with us unless they have an interest in trying the generic equivalent, and it's helped educate our customers. And it's really helped propel sales of generics," Lane noted. From March of last year to the end of December, Lane said, Duane Reade "exceeded our internal targets for growing generic sales and the trend upward is continuing." Lane said that Duane Reade also tries to stay on top of all branded drugs as they come off patent, and as soon as they do, Duane Reade begins promoting the new generic with easels on pharmacy counters. "When Prozac came off patent, we set a target of converting 75 percent of its customers to the generic, and we exceeded that," Lane said. "About 80 percent converted." Going forward, Lane said Duane Reade plans to order some new pamphlets that the FDA recently began publishing on how hard it is for a generic drug to be approved. "That should help the customer understand that generics are high quality drugs, as well as cost effective drugs. When we get the pamphlets, we'll distribute them at the pharmacy," he said.